Frankie Dettori - the most famous jockey in the world and the most popular. Mr Dettori is that rare thing in horse racing - a real superstar. The Italian-born jockey's ability in the saddle, cheeky good humour, immaculate dress sense and spectacular flying dismounts have made him a household name. Bidding to win the 2005 Flat Race Championship, Dettori rode three winners at Leicester Racecourse on the 11th October 2004 and it was then that he captured the attention of V-SOL. His magnificent winner did not quite clean out the bookies, but it was an incredible ride nonetheless. The horse in question "YASHIN", owned by Roalco Limited and trained by Mark Tompkins, had up until that day been proving a real challenge. Frankie first rode YASHIN on 5th August at Folkestone coming 4th out of 8 runners. The excitement on the day, knowing Mr Dettori was wearing V-SOL silks, was only superceded by our disappointment at the result. 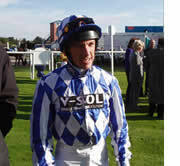 Undeterred, however, Frankie chose to then saddle up for a second attempt at Yarmouth on 14th September. On the day, he was heavily backed (odds on favourite) and tipped by most to win. Had any other jockey been able to get 3rd out of 15 we would have been happy but such is the expectation when Mr Dettori rides, we were all disappointed. Some jockeys would have given up at this time, but not Frankie Dettori. When it came to his third attempt, he spoke to us before the race and said, "Why, oh why am I riding this horse again?" Even with the fact that punters latch on to Dettori's horses - the so-called "Frankie Factor" - the bookies did not make YASHIN favourite. It may be because it was clear for all to see that on his previous attempts he had worked hard to get the best out of YASHIN, but without the result we all wanted - a WIN! This particular day we were all amazed as he instructed that the horse be saddled up very early and was first out on the course. Frankie proceeded to walk the horse all the way round to the start, the long way around. We could only imagine, at the time, that he wanted to calm the horse and make him feel comfortable. Well, it certainly made the difference because at about three furlongs out, YASHIN burst to the front and took an easy 20-30 length lead. I remember clearly the Course Commentator saying that Dettori was so far ahead of the rest that he just had to decide to how much to win by and at about 1 furlong that is exactly what happened. Frankie stood up from the saddle looked back and took the most comfortable 12 lengths win I have ever seen. This is the best day I have had at the races to date - V-SOL's first winner as a sponsor and ridden by the most famous jockey in the world! Thank you Frankie Dettori, not least for the picture - V-SOL wish you continued success for the future. To win this race Dettori had to use all of his talent and knowledge. Particularly in evidence that day was his trademark skill, the ability to ride with his hands as low as possible, which has the effect of relaxing the horse. Demonstrating his innate ability to get the best out of a horse, especially in the latter stages of a race, could not have been shown better. If you would like to see a video movie of the master in action please email us: marketing@v-sol.co.uk and we will do our best to oblige. V-SOL are the official sponsors of all horses owned and part owned by Roalco Limited.